The idea of this particular form of Roberto Piaia’s sculptures – worldwide premier – has been Copyright recognized and protected. Genesi – Carrara Statuary Marble height 196 cm. with basement width 136 cm. depth 45 cm. Over – Carrara Statuary Marble height 83 cm. with basement width 118 cm. depth 55 cm. Navitas – Carrara Statuary Marble height 200 cm. with basement width 36 cm. depth 47 cm. These Statues are created by a spiral that wraps around the figure of the body. Although formed in part by emptys, it does not betray it’s original forms. Rather, using the I see/don’t see effect, the eye is captured by a visual effect that fills the representation of the object. 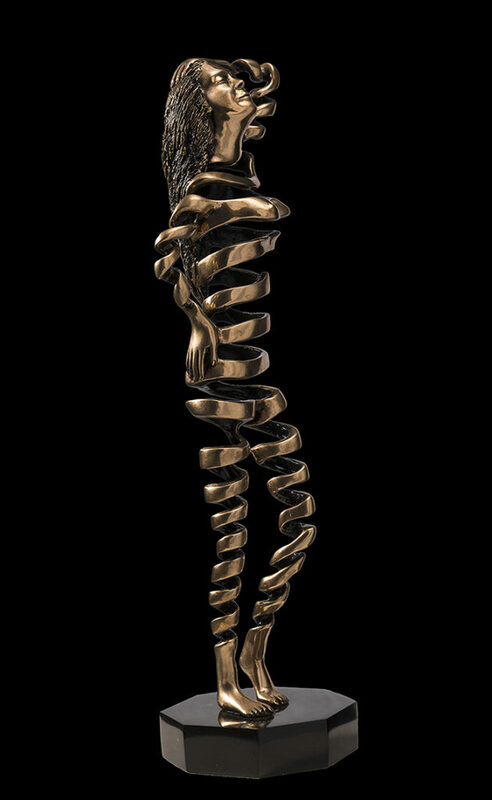 Over – Bronze height 110 cm. with basement width 116 cm. depth 40 cm. Mudra – Bronze height 100 cm. width 30 cm. depth 35 cm. Breeze – Bronze height 28 cm. width 8 cm. depth 5 cm. Built using Carrara statuary marble, resina, and bronze casting through lost wax processes. The statues are created with the face, the hands and the feet, where the typical Piaia executional skills stand out. These statues employ strange perception and perspective, and seem impossible to achieve in reality. They take us back to a strong mathematical component by the master who inspired Piaia: Dutch graphic engraver Maurits Cornelis Escher, 1898-1972. Genesi – Resin height 93 width 135 cm. depth 43 cm. Mudra – Resin height 100 width 30 cm. depth 35 cm. depth 30 cm. This is a very difficult job, attempted by many but never actually realized. Characterized by a precise study of solids and voids, realized in a perfect balance of matter that does not need any support.